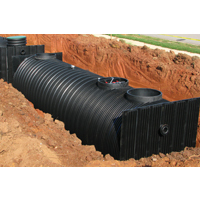 The Magellan decentralized wastewater treatment system is designed with DuroMaxx steel-reinforced polyethylene (SRPE) for onsite treatment of 2,000 to more than 250,000 gal of wastewater per day. Magellan’s packaged design provides “plug-and-play” installation, along with simple, low-cost operation and maintenance. Contech provides engineering, installation, commissioning, operator training and system certification services, making it a cost-effective solution.